iTunes not recognizing iPhone Windows 10 – The best operating system which you can use for Apple device is Mac. If you are using an iPhone then you should use a Macbook or iMac as these systems come with the best features for iPhone, iPods, and other Apple devices. If you are not having a Mac system then you can use Windows operating system too. As Windows 10 is the latest operating system which is available out there you can use iTunes on your Windows 10 computer to transfer data from your computer to your iPhone. A lot of people who are using Windows 10 computer have informed us that iTunes not recognizing iPod, iPad and iTunes not recognizing iPhone in Windows 10 system. If your iPhone is not detected by your computer then you might experience iTunes not recognizing iPhone. This issue is common with the people who are using the latest generation iPhone i.e. iPhone 6S. If you are also experiencing iTunes not recognizing iPhone on your Windows 10 computer or if iTunes doesn‘t recognize your iPhone, iPad, or iPod devices then you are at the right place. Today we are going to tell you how to fix iTunes not recognizing iPhone in Windows 10 PC. How to Recover Lost or Deleted Photos on iPhone Devices? If you have recently upgraded to Microsoft Windows 10 operating system and found that iTunes no longer detected your iPod Touch or iPhone, you may feel very frustrated. But you shouldn’t worry too much about iPhone not connecting to iTunes Windows 10 because we have got some sure shot solutions for this error. This is the simplest method to fix iTunes not recognizing iPhone in Windows 10. If you are connecting your iPhone or iPod for the first time with your computer and iTunes not recognizing iPhone then you can simply reboot your Windows 10 PC. Once you have rebooted your computer connect your iPhone to your computer and you won’t be getting any error like iTunes not detecting iPhone in Windows 10 system. If you were not able to fix iTunes not recognizing iPhone in Windows 10 by rebooting your computer then you can follow the next method. Step (1): First of all, check the iTunes version which is installed on your computer. Your computer should be running on the latest version of iTunes. Step (2): Once you have checked the iTunes version, connect your iPhone to your Windows 10 computer. Make sure that you are using the original cable and not the aftermarket one. When you see the message notification, click on the “Trust” button. Step (3): Now to fix iTunes not detecting iPhone in Windows 10, you need to open “Control Panel” on your computer. To do so, go to the start menu and type in control panel in the search bar then hit the Enter key. Step (4): From the All control panel items window, select “Hardware and Sound” option. 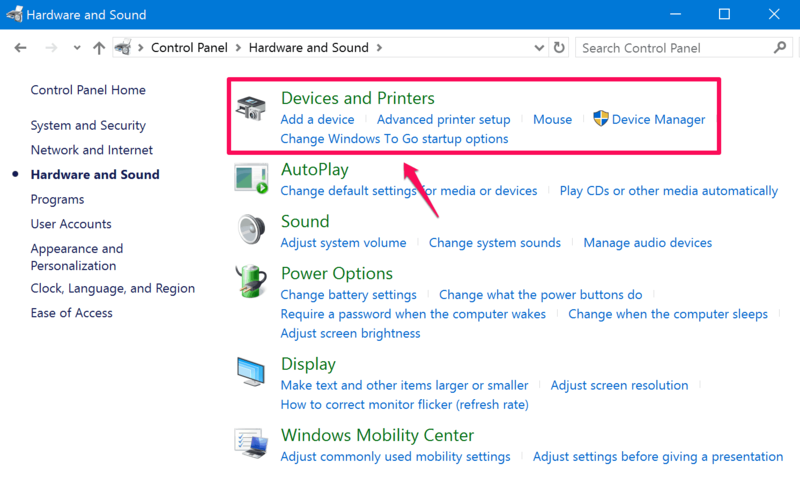 Step (5): Now you have to select “Devices and Printers” option to see all the connected devices on your PC. Step (6): You should see your iPhone, iPod or iPad under the “Unspecified” section. If your iPhone is present under the Unspecified section, it means iTunes doesn’t recognize iPhone. Step (7): Now Right–click on your iPhone icon and then select “Properties” option. 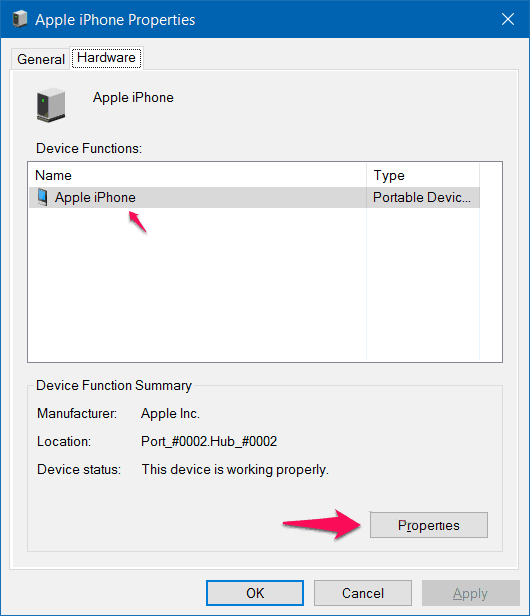 Step (8): On Apple iPhone properties dialog box, go to “Hardware” tab. Here you have to select your iPhone from the “Device Functions” section and then click on “Properties” button. Step (9): Now, go to the “General” tab and then click on the button which says “Change settings“. Step (10): After that, open the “Driver” tab and then select “Update Driver…” option. Just after the click, the procedure of updating drivers on your Windows 10 computer will start. Step (11): Now you have to select the second option “Browse my computer for driver software” when you are asked how you want to search for driver software. C:\Program Files (x86)\Common Files\Apple\Mobile Device Support\Drivers. Step (12): Finally, click on Next button and the drivers will start updating. Once the driver is updated, click Close button to close the Update Driver Software wizard. That’s it! 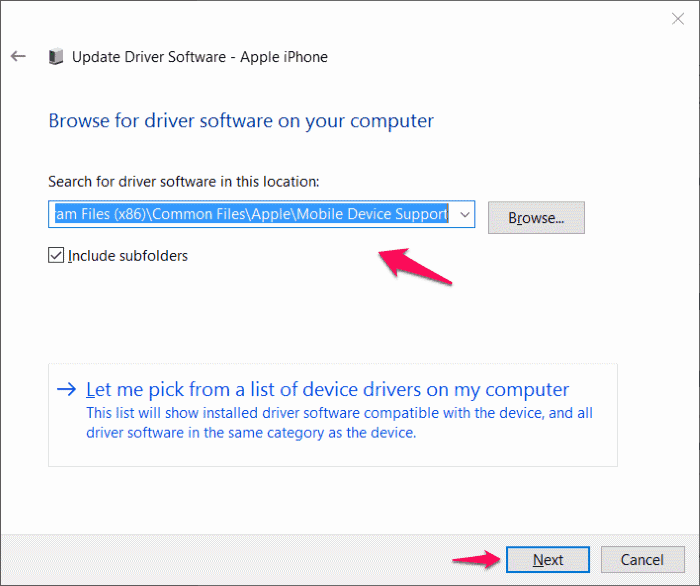 Important note: In case, if you are unable to see the Drivers folder then select “Mobile Device Support” folder and then make sure that the option says “Include subfolders” is selected. Once the drivers are updated of your iPhone you won’t be experiencing iTunes won’t recognize my iPhone issue. Now, you can open iTunes and your iPhone will be detected by the software next time on your Windows 10 computer. Thus, you can see how simple is to solve iTunes not recognizing iPhone in Windows 10 issue. We hope, this guide perfectly helped you and answered you questions – What to do if iTunes doesn’t recognize iPhone or iPad or iPod on Windows 10 computer? What are some best methods to fix iTunes in Windows 10 not detecting / recognizing iPhone devices? Why iTunes not recognizing iPod in Windows 10? Thank you so much. Worked perfectly and the best how to I have ever gotten! Thanks for sharing your view. I am very happy to know that this Windows 10 tutorial helped you in solving the problem of iTunes: iPhone or iPod Not Detected in Windows 10 computer. This is a very common Windows error and most of the people who has recently upgraded to Microsoft Windows 10 they found that iTunes no longer detected their iPod Touch or iPhone. Stay connected with us. Keep reading and commenting !! Thank you so much. I needed my playlists for class and was pulling my hair out! Easy fix. First of all, welcome to zero dollar tips blog and thanks for sharing your opinion after getting the appropriate solution. It’s really great to know that you got the perfect help with this guide How to solve a problem where your Apple iPhone, iPod or iPad is not detected by Microsoft Windows 10 Computer.